For me, The Carpenters stand as the absolute antithesis of easy listening, presenting song after song to the listener that look searchingly into what it means to be alive and face the likelihood of vulnerability and disappointment. This is achieved with a stoicism and a lack of grandstanding that makes their work amongst the most grown-up in pop, supported by memorable, spacious arrangements that allow the mood of the songs to truly breathe and allow the listener to enter into the world of the music. 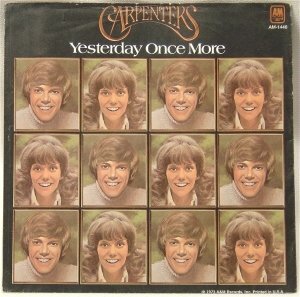 None of this would be possible without the wonder that was Karen Carpenter's voice, my favourite in pop, with its remarkable capacity for intimacy, a sense of closeness and compassion that made Herb Alpert remark that listening to her sing was "almost like she had her head in your lap". Every song seems like a confidence entrusted to you, the listener, alone. By the time that you get to the latter records, things like 'Make Believe It's Your First Time' and 'Touch Me When We're Dancing' the effect is almost unbearable, half-literally the voice of a dying woman, her brother's way with a tune and an arrangement audibly faltering behind her. As they MELT THE YEARS AWAAAY! Something has gone horribly wrong for her between then and now. Love either never came, or failed, or was sought in the wrong places. The anticipation of grown-up feeling meets its actual reflection through the portal of the nostalgia show. The dear old music, "back again, just like a long-lost friend", doesn't help her deal with the present. It's as desperate as watching somebody hug themselves for comfort and understanding. Flashing past her eyes like a suicide whose life flashes past her eyes. are repeated on a loop, each time fading further into silence, against a single static piano chord. The breaking string. The severing of the past from the present.